How to bring out our innovativeness? You probably all know how an iceberg – a huge block of ice floating in the coldest seas – is made. Given that the density of ice is around 920 kg/m3 and the density of sea water is around 1025 kg/m3, approximately 90% of the volume of an iceberg remains hidden under the surface of the water, while the other 10% remains visible as it hasemerged. 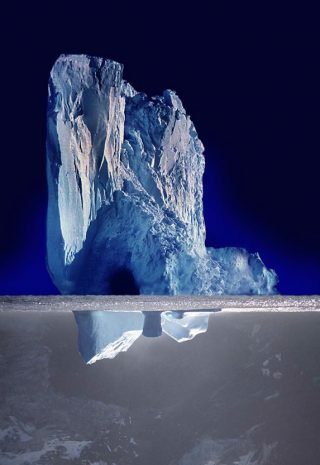 Now, bending the laws of physics using imagination, let’s imagine that this iceberg can be overturned, with the smallest part below water level and the largest part completely emerged and visible. Let’s now try to make a further effort of imagination and associate the concepts of “innovativeness” and “reliability” respectively to the immersed part – remember that it is the smallest one because in our exercise the iceberg is overturned – and to the emerged part, the largest, of our strange iceberg. Now it should all be a little clearer, it’s a question Innovation Management, physics has nothing to do with it, not even ice. The concept of “innovativeness” is linked to the perception that our interlocutors have of our ability to be innovative, to have a multidisciplinary vision of the processes of innovation, which is not exclusively technological, but is of wider scope, linked to the business and centered on the final user. It is a concept linked to the ability that our organization has, or should have, of thinking outside the box, of proposing business solutions derived from experience from other markets and correctly adapted to new ones, in a non-trivial way and in the search for new business opportunities for companies and new services to be offered to final consumers and citizens. The concept of “reliability” is instead linked to the perception that our interlocutors have of our ability to better manage mainstream, activities, our traditional offer, the products and services we have in our catalog, the esteem and trust they place in we when they entrust us with a delicate activity, often on the critical path of much larger projects and which perhaps often represent the core business of our customer. What is interesting is that often those who look at companies from outside, from a point of observation outside the organization and which inevitably coincides with that of the customer, see it exactly like an inverted iceberg; that is, they are able to see and judge only the reliability of an organization based on direct experience or the representation of itself that the organization is able to transmit to its reference market. Unfortunately, from the same observation point it is much more difficult to see the activities related to the concept of “innovativeness”, because they are hidden and more difficult to place concretely and immediately on the market, especially if they are really innovative technologies or models with a level of industrial maturity that is still low. Communicating innovation is much more difficult than communicating traditional activities, for which it is often sufficient to demonstrate on the ground the results of the work that is carried out daily. Communicating innovation, on the other hand, often means identifying together with customers – in a relationship that evolves and often becomes a partnership – how new technologies, methods or models can make a real contribution to the business growth of all the players involved in the medium and long term. Many consider this a secondary problem, but it is not at all. We must never forget that today’s revenues are created with traditional mainstream activities, but tomorrow’s revenues will be achieved thanks to the innovation of today and will only be achieved if today our organization is able to be innovative and be perceived as such by its reference market. The innovativeness of an organization is a complex feature and can be measured using numerous indicators, KPI which often also depend on the type of organization, the market that it addresses and the degree of maturity of the innovative solutions it offers on the various markets. In any case, innovativeness has two different dimensions through which it can be measured, even if with different indicators: real innovativeness, which answers the question “How innovative are we?”, and perceived innovativeness, which answers the question “To what extent does our reference market consider us innovative?”. As you can imagine, the two dimensions are equally important and in no case overlapping: it is possible, for example, to have companies that transmit a good perception of their innovativeness, but which to all effects have no real innovative solutions and are not able to innovate their business or that of their customers. In these cases it is a question of mistaken perception induced by questionable communication policies and which customers learn to steer clear of over time. On the contrary, there are organizations with extraordinary potential linked to innovative solutions and potentially disruptive business models, therefore very high real innovativeness but poor capacity of communicating innovation activities; this translates into a very low perception of overall innovativeness on the part of the market, with the consequence of finding oneself with missed business opportunities and sometimes difficulties in bringing to the market what has been produced thanks to the investments made. In this case we are faced with companies which are perceived by their market as previously indicated with the inverted iceberg metaphor: reliability for mainstream activities and little overall innovativeness, only because the perceived innovativeness is low, irrespective of how relevant the real innovativeness is. Solving this problem is possible, even if it is hardly a question of short-term operations; changing the perception that customers have of us is very easy, but only if the change occurs in a negative way because of some disappointment that we can generate about mainstream activities for which the customer gave us their trust. Changing the perception of a customer in a positive way is, instead, a long job that needs concreteness, passion and mutual trust. The road to follow is based on proceeding in two directions that are orthogonal to each other, but which together constitute a true change of pace compared with the past and make it possible to open up huge opportunities. Extracting the iceberg completely from the water in which it is located. It is a matter of increasing the perception of innovativeness that the market has of us. Extracting the iceberg from the water in which it is located means showing the world – and therefore our reference market – all the innovation initiatives that the organization has in the pipeline and is able to govern, regardless of their degree of maturity and of the market for which they were designed. It means presenting yourself to the market as a single innovative reality even in cases where you are large and segmented on different markets, able to take advantage of innovative experiences and propose them on different markets, adapting and contextualizing them to the best. When you are small, it means presenting yourself to the market as a part of something bigger, able to provide innovative solutions, also thanks to partnerships with other companies capable of mastering innovative – even very vertical or borderline – themes to the best, in an authentic ecosystem based on mutual virtuous contamination. Increasing the quantity and quality of innovation initiatives. This is about increasing real innovativeness by triggering correct innovation processes within the organization. To this end, it is necessary to activate tools and initiatives that enable the birth of new ideas and communication among people who are more predisposed to dealing with innovation or innovative technologies. For this purpose, internal communication and sharing are fundamental tools for increasing the number of opportunities that can arise in an organization. It is also necessary to carry out technological and methodological scouting at all levels, maintain important relations with reference ecosystems on themes of innovation and take an active part in international working groups that establish guidelines and standards, in order to contribute to building the future of innovation and not being subject to what has been designed by others. Finally, it is necessary to make the most of nascent innovation initiatives, channel them into a process that allows them to escape the logic of exclusively technological innovation, and find them a concrete positioning on more than one market; in fact, technology is an extraordinary enabler, but innovation is real only if it generates value, if it contributes to the improvement of people’s living conditions and if, as often happens, it saves lives. Overall innovativeness is therefore a characteristic of organizations and can be brought out; simply use the right tools that permit overturning an iceberg, extracting it from the water and changing its shape, and this can only be done by thinking outside the box. Innovation: do we look for beauty to pursue what’s right? Digital Transformation: are Italian companies ready?